VARCO Windows & Doors is well on the way to being the 'go to' vendor for Chicagoland HOAs and Property Management Companies. Call us for references! We are very proud to announce that VARCO Windows & Doors has been recognized by the Better Business Bureau with a 2012 Honorable Mention Award for ethics in the marketplace. All of us have worked very hard to achieve such an honor and we look forward to continuing to serve our customers with excellence. VARCO Windows & Doors is a family-owned and operated, BBB accredited company serving the industry for almost 20 years. 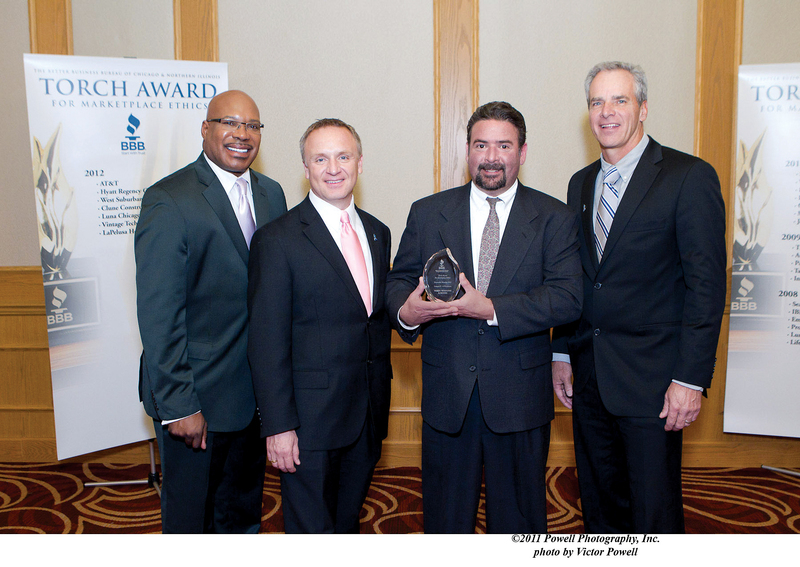 Photo from the Better Business Bureau 2012 Torch Award ceremony held at the Rosemont Hilton in early December. From left to right: Hosea Sanders/Channel 7 Co-Anchor-Awards Presenter, Steve Bernas/President & CEO of BBB, Phil Varco/Owner Varco Windows & Doors, Roy Spencer/BBB Chair President. Write us a review at Thumbtack.com or visit us on Facebook!